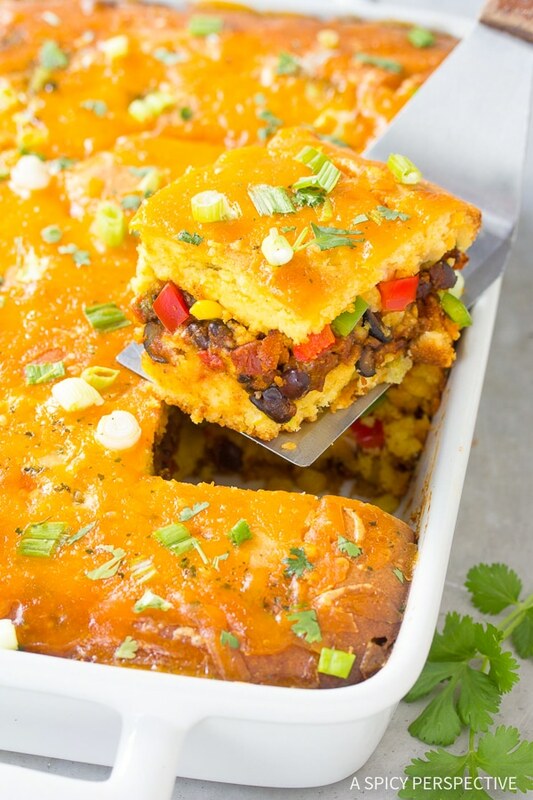 Colorful zesty Stuffed Fiesta Cornbread Casserole, a one-pan dinner that will make you say ole! This is where tacos and cornbread collide to create Stuffed Fiesta Cornbread Casserole. It is a one-dish meal that satisfies all of your cravings for both tacos and cornbread. Golden cornbread is laced with green chilies and sweet corn, stuffed with abundant layers of your favorite taco fillings, and topped with more delicious golden cornbread, cheese, green onions, and cilantro. 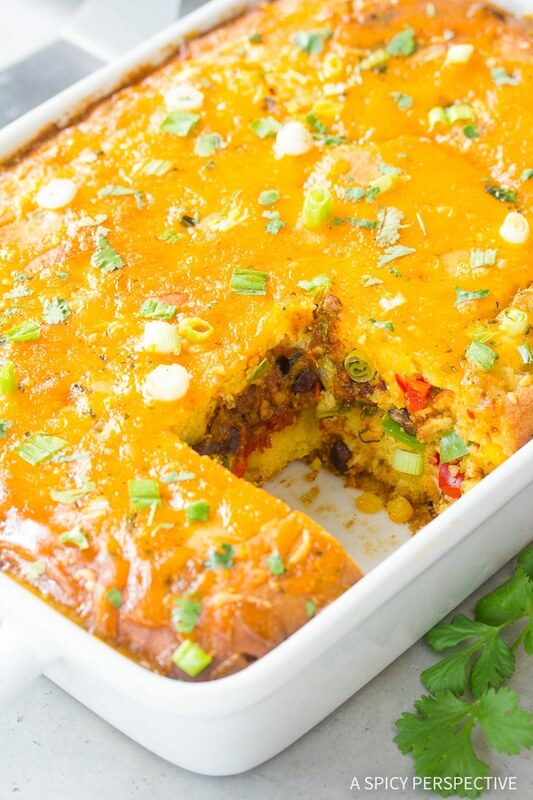 Stuffed Fiesta Cornbread Casserole is hearty, gratifying, and loaded with flavorful veggies, ground beef, and cheese. I like to consider it a well balanced comfort food. 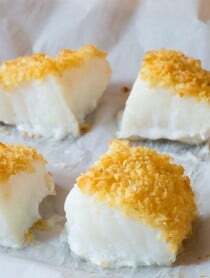 This is a recipe I have been making for years, since my kids were little, maybe even B.C. (before children). We used to call it “Taco Pie”, yet it is not a taco and it is not pie, so the name got an upgrade to one much more appropriate. Whether you call it Stuffed Fiesta Cornbread Casserole or Taco Pie, just do not call me late for dinner! Layer after layer of lively elements. It’s fun to prepare and fun to devour. It’s colorful and bountiful. This is a true fiesta. Stuffed Fiesta Cornbread casserole feeds a load of people. 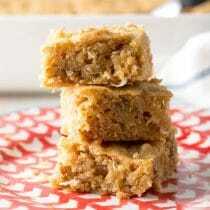 I use an 8 inch x 12 inch baking dish for this recipe. It makes for taller pieces. You can use the standard 9 x 13 inch baking dish if you like. It works beautifully as well. In my house we get two to three meals from one pan of Stuffed Fiesta Cornbread Casserole. 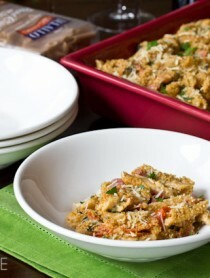 It makes wonderful leftovers that are just as delicious as the first day you make it. 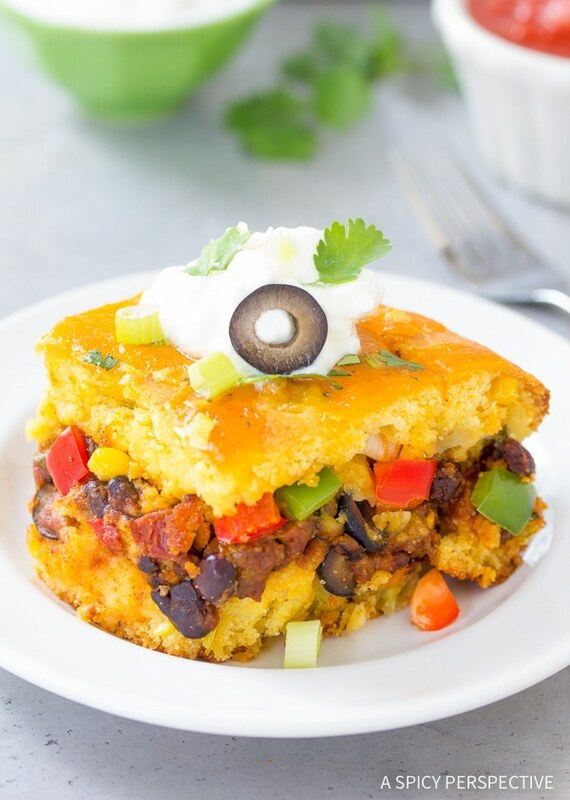 Stuffed Fiesta Cornbread Casserole freezes very well. I like to keep an extra pan in the freezer for a busy day, or to share with a friend in need. 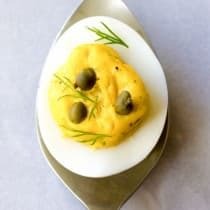 This is also an easy dish to convert to a vegetarian meal. 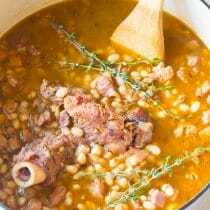 Simply omit the ground beef and replace it with another can of beans. Stuffed Fiesta Cornbread Casserole is perfect served solo, with a simple salad, or on a bed of shredded lettuce! 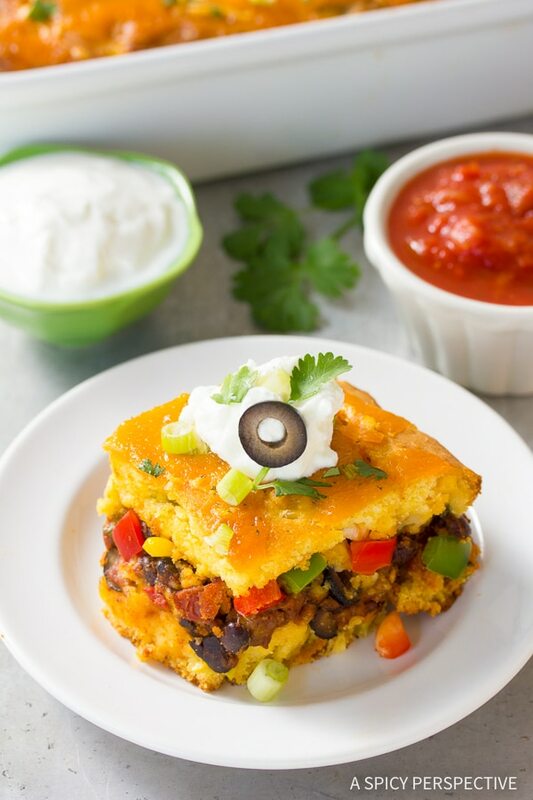 Stuffed Fiesta Cornbread Casserole Recipe - A loaded Mexican cornbread with colorful layers and tons of flavor! It's a side dish and a meal, all in one. Preheat the oven to 400 degrees F. Place a large skillet over medium heat. Add the ground beef and taco seasoning. Break the ground beef into small pieces as it browns. Stir in the black beans and tomatoes. Simmer until most of liquid has reduced to a thick paste. Prepare the cornbread: Mix all the dry ingredients together in a bowl. 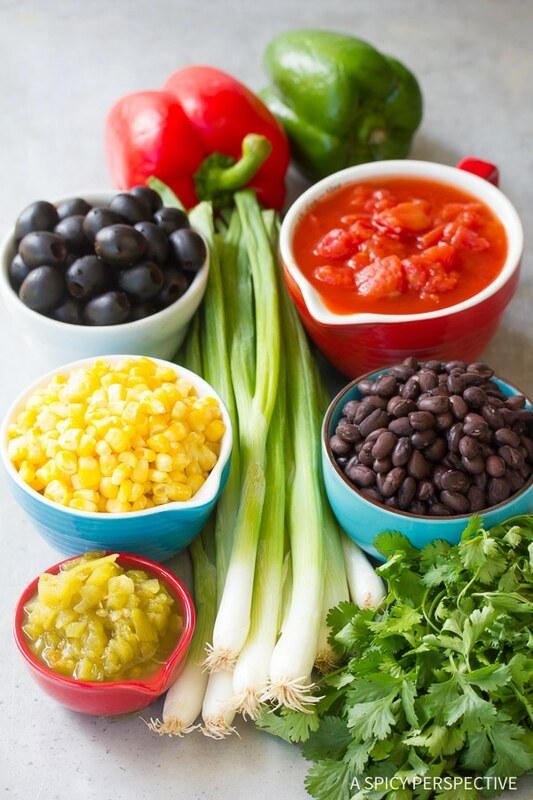 Mix the wet ingredients together in another bowl. 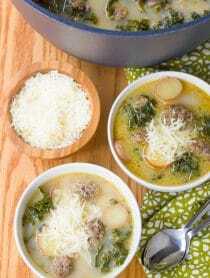 Stir the wet ingredients into the dry ingredients until almost combined. Mix in the corn and green chilies. Stirring until everything is just combined. Don't over mix. Spread half of the cornbread mixture over the bottom of a buttered 8x12-inch or 9x13-inch baking dish. 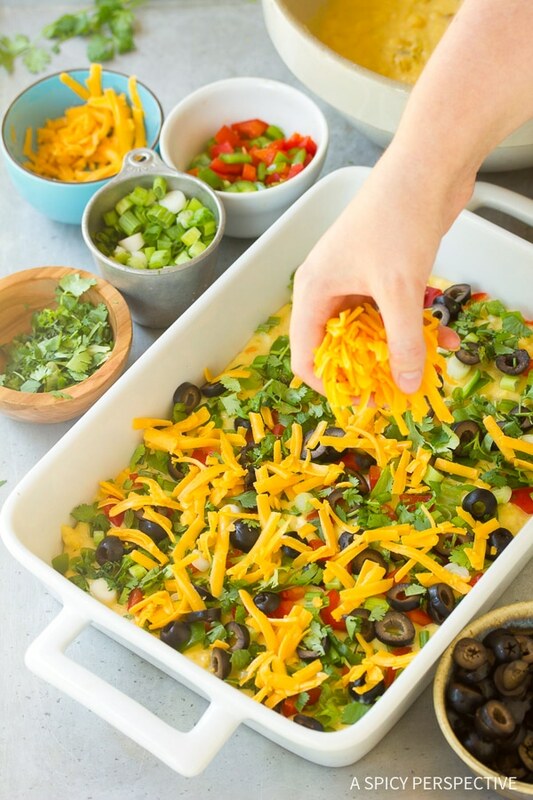 Layer in order one-half of each filling: bell peppers, green onions, black olives, cilantro, and one-third of the cheese over the cornbread. Top that with all of the seasoned ground beef, bean and tomato mixture. Repeat step 5 in the opposite order, starting with one-third of the cheese, then the rest of the cilantro, olives, onions and peppers. Top with the rest of the cornbread mix. Bake on the middle rack for approximately 30 minutes. Check to see if it's done by inserting a toothpick into the cornbread. If it comes out clean, it's ready. Bake 10 more minutes if needed. Cover the top if it's getting too brown. Sprinkle with the rest of the cheese, reserved green onions, and cilantro. Pop it back in the oven until the cheese is bubbly. Hi, Can I use corn bread mix packet? 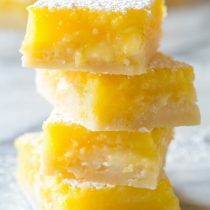 Is one 20oz packet enough for this recipe (15 servings)? Also, can beef be replaced by tofu?